Choose the topics you wish to keep up-to-date with and receive expert articles from our specialists on a monthly/quarterly basis. I do not wish to receive seminar invitations and special offers. Only send me the topical newsletter I selected. Analyst Express Keep up to date with the latest advances in analytical chemistry and physical measurement technology. Receive invitations to our free workshops and to our certified training courses. Foodlab Discontinued: Please subscribe to FoodLab plus Beverage instead. Teaching and Research To shape a sustainable world for future generations, research and teaching in chemistry needs to stay in the vanguard of developments. Metrohm Australia recognise the tremendous importance of your mission, providing you with up-to-date scientific applications, research results and developments. This makes Metrohm your partner of choice when it comes to chemistry teaching and research. Mines and Minerals Water Quality Control, Sample Preparation and Analysis in the mining industry is essential. This newsletter is published twice every quarter, containing analytical applications and solutions relevant to the industry. Learn from the experts. Process Analytics For everyone involved in on-site, on-line and at-line measurements, this monthly newsletter is a must. Written by our experts, the articles provide in-depth knowledge about relevant process analysis topics. Chemicals Analysis + Petrochemicals Within just a few decades, numerous important industrial processes were developed that still shape today’s chemical processes – from the chlor-alkali to the Solvay process, to name just a few. The production of high-tech, high-purity chemicals requires safe and reliable analytical solutions. Tap into the vast knowledge and experience of the world's leading scientists. Published bi-monthly. Foodlab PLUS Beverage Monthly brief on food and beverage analysis. Our new Foodlab plus Beverage covers analytical topics and news for the professionals involved in analytics and quality control in the food and beverage industries. 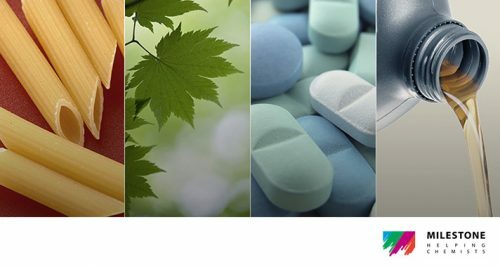 Pharma and Nutraceuticals Bi-monthly brief on the latest techniques for pharmaceutical and nutraceutical analysis. Guarantee product safety by determining identity, content, quality, purity, and stability of pharmaceutical and nutraceutical products using analytical chemistry. Solid Science by Retsch The newsletter "Solid Science, Trituration and particle characterisation" aims at keeping you informed about the latest advances in milling, sieving and particle analysis technology and at passing over to you our knowledge and experience regarding related applications.